Like many Twitter users we love, Stu primarily tweets about what he eats. He eats a lot: everything from kabocha squash to beef trimmings to lobster shells. He loves lobster shells. That's because Stu isn't a person. He's a stew. Like many Twitter users we love, Stu primarily tweets about what he eats. He eats a lot: everything from kabocha squash to beef trimmings to lobster shells. He loves lobster shells. That's because Stu isn't a person. He's a stew—one that has been given an affectionate nickname (and a handle, @perpetual_stew) by the kitchen staff that has come to know him during the five months he has been simmering at New York City's Portuguese-influenced Louro restaurant. 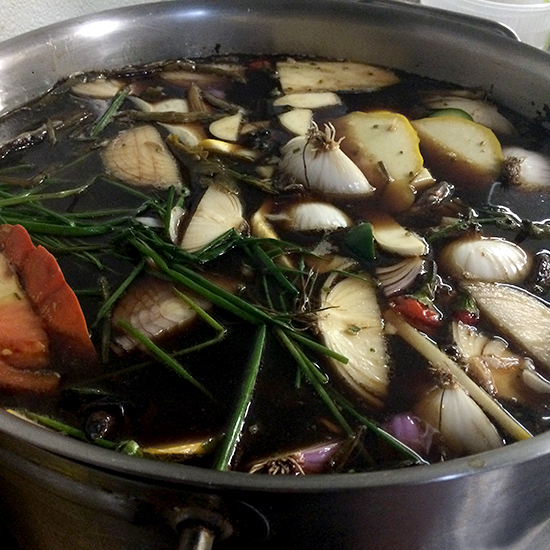 Chef David Santos prides himself on avoiding food waste and decided to create a broth from kitchen scraps last August—and it's the same one still simmering on the stove today. Here's why that's not terrifying and actually pretty cool: Constant simmering means bacteria can't develop, and Stu is frequently and thoroughly strained. Every bit of solid food is removed, and what's left is an incredible broth that contains layers upon layers of savory flavor. Fed every couple of days with a mix of vegetable peels, fish heads, shrimp shells, chicken carcasses, water and other edibles on hand, this Perpetual Stew forms the umami-packed base for some of the restaurant's most popular dishes, like garlic soup and duck ramen. And, starting today, customers can get more intimate with Stu: The broth will be served à la carte, flavored either Japanese-style with mirin and soy or Portuguese-style with wilted greens, black pepper and olive oil. Santos swears by the stew not only for its ever-evolving taste profile but also because of its curative properties. “The health benefits are amazing,” he says. “When a chicken carcass is in there simmering for two days, you get every vitamin and mineral in the marrow—it all goes into the broth. All of the kitchen staff has at least a pint of stew every day, and none of us has gotten sick this year.” We don't have scientific evidence, but that sounds more effective than this year's flu shot.